Nivan Dalvilu is a Dunmer warlock residing in Bleaker's Way, a small village in the Great Forest. 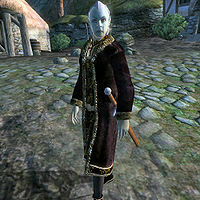 Patriarch of the Dalvilu family, Nivan is one of the targets of the Daedric Quest received from Mephala. One of the two leaders of the small community, Nivan lives in peaceful co-existence with the other family in town, the Ulfgars. Despite being a powerful wizard, he believes in compromise over confrontation and as a result enjoys great respect among the townsfolk. He wakes up every morning at 6am and spends the first two hours of the day enjoying his breakfast at home. At 8am he heads outside where he will meet up with another Dalvilu, namely Satha. She stays near him for two hours, before he gets a visit from Malyani Dalvilu, also for two hours. At noon he heads back inside his house for two hours of wandering. At 2pm he enters the towns popular inn for four hours of social gathering with both families. At 6pm he returns to his house for some more wandering and at 8pm, he heads outside once again and finds himself a spot in front of Arvin Dalvilu’s house, occasionally chatting with the other town leader, Hrol Ulfgar. He returns to his house at 10pm and stays there until his bedtime at midnight. While the rest of the family is clad in lower-class clothing, Nivan’s status as clan leader shows as his attire is pure upper-class: A black & burgundy outfit with gold trimmed shoes. He carries an iron shortsword, a spare red velvet garment, his house key and a surprisingly meager amount of gold. Nivan knows a leveled set of warlock spells, as well as one extra major Destruction spell. When you approach him, he will give you the typical Bleaker’s Way greeting and welcome you to the settlement. But he will also give you a bit of background info on the relationship between the Dalvilus and Ulfgars: "Dalvilus have lived here peacefully with Ulfgars for generations. As leaders, Hrol Ulfgar and I work hard to preserve that tradition." When asked about their patriarch, all the Dalvilu family members will tell you the same thing: "He is the head of our family. He works powerful magic, but his true gift is compromise. He is a wise, wise leader." The members of the Ulfgar clan will show their respect as well: "He leads the Dalvilu family. He is a wise man, and a powerful wizard." Mephala: Start a feud between two prominent families.